Let me just say that a lot can happen in a few days. 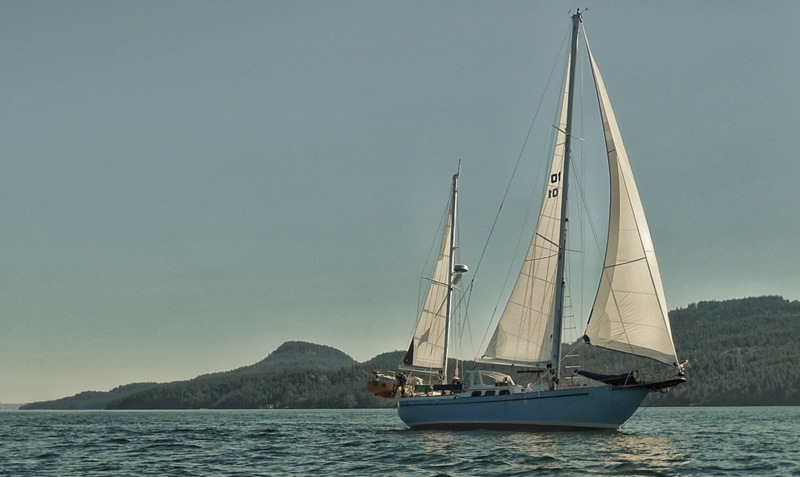 As I write this, Small World is currently anchored on the south side of Spencer Spit on Lopez Island. For the last several days, we have been hanging out with Beth and Cody. You may remember them from last year’s trip to Lopez Island when we first met. This year, they tracked us down and changed their plans so we could cruise together before pointing this blue beauty out into the ocean. While Beth didn’t make us any fresh cookies this year, I forgave her because she did bake madeleines that were delightful! That’s another recipe I’m going to have to steal. On second thought, maybe not… because I could’ve eaten an unholy number of them and surged ahead in the Biggest Ballast competition. If I get my hands on that recipe, maybe I’ll get back to Seattle one day and you’ll ask, “Krystle! What happened?” And I’ll have to say “Ask Beth” because I’ll be too busy stuffing my ever chubbier face with even more madeleines. I predict that Beth will eventually comment on this post with the recipe for all of you dear readers, but don’t say that I didn’t warn you. Because I did. And I won’t be held responsible for the fallout when you have to replace your wardrobe and your couch cushions start to sag. Other than scrumptious baked goods, these nefarious characters have been a handful. First, they took forever to get here. Probably because they essentially sail exclusively because they’re a couple of badasses who built a boat on their own and decided they didn’t want an engine and the Pacific Northwest wind is a fickle SOB. After they made us wait forever, they hosted us on their boat for drinks and shared a bonfire on the beach with us. The audacity of these two is just impressive. 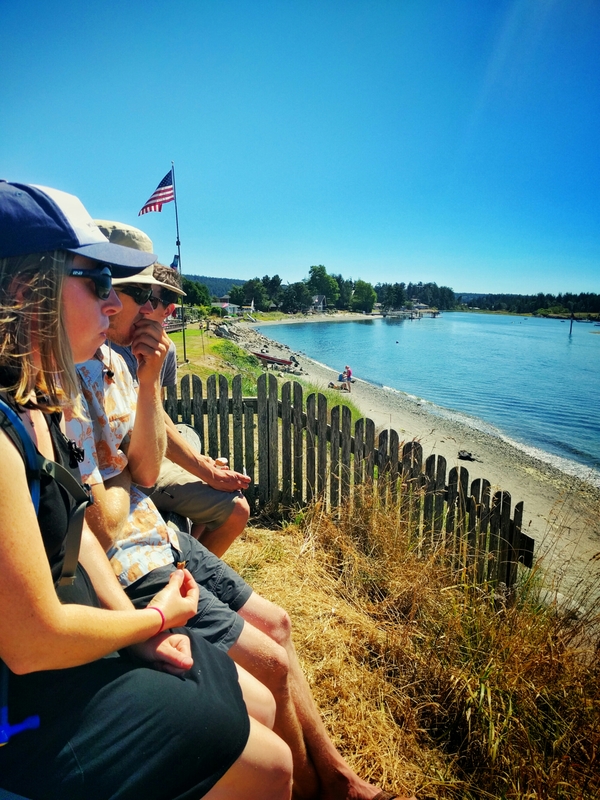 The next day they invited us to join them on a walk into town, with the promise of ice cream from Lopez Island Creamery at the end. I mean really, how is anyone supposed to turn ice cream down? So we walked all the way across the island and back, picked some wild blackberries, got some library Wi-Fi, indulged in ice cream, shopped at the grocery store and local farms, and talked to cows. I told you they were crazy. I don’t know what we were thinking when we invited them over for a potluck dinner! Or when we invited them to sail down the coast with us on Small World. That’s right! You heard it here first (unless a little birdie already told you, you sneaky sneak)! Details are still in the works, but (knock on wood) we have some people who are at least as crazy as we are to join us on the way to San Francisco. To sweeten the pot, we decided that we should all go for a sail together aboard Small World. That way, Beth and Cody would really know what the boat felt like under sail. 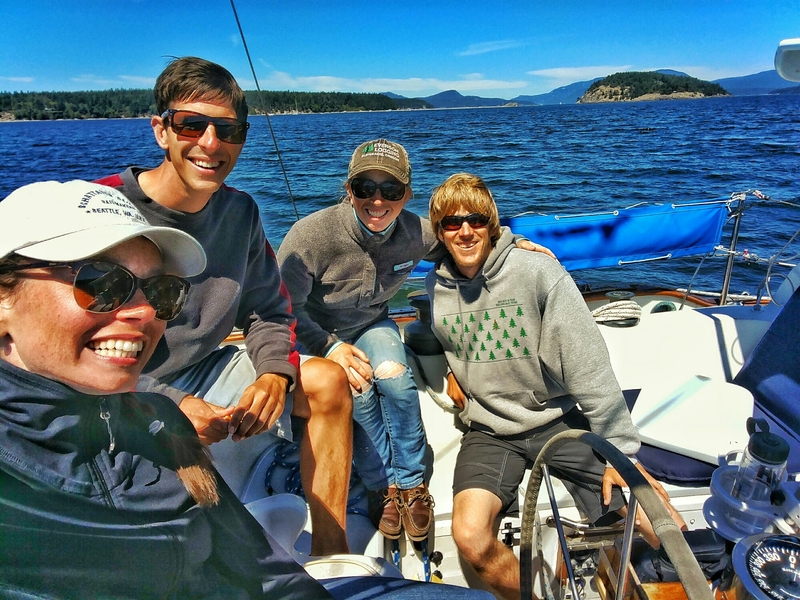 The wind picked up enough to take them out for a sail around Lopez Sound. It was a beautiful day for sailing and the old girl (not Beth because she’s the youngest in the group and not me because I’m refusing to admit I’m the oldest of the group) did her thing. We sailed up wind and downwind and made a nice little pattern on the GPS while tacking back and forth. They even convinced us (me) to set the anchor with sails only. 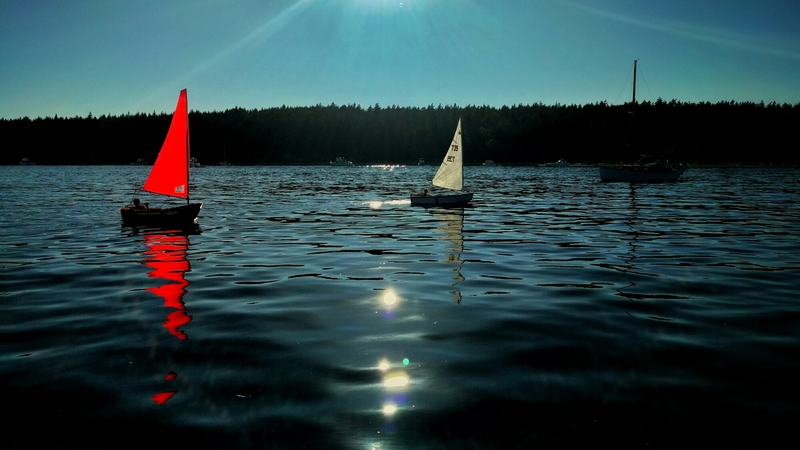 If you’ve ever heard Craig talk about sailing, he may have mentioned this skill as something he’d like to acquire. It was always something that was daunting for me and it was just easier to do it with the engine. I’m sure you’re shocked. But I think when you’re testing these skills with your actual home, a little caution (anxiety) is healthy. No one try to tell me otherwise. I won’t listen. That’s sarcasm, but also true. After some dinghy races and some wine, we made a plan. We are now holding several of their personal belongings hostage as insurance to make sure they come back in mid-August after our scheduled haul out. We just went from near strangers to friends and shipmates. Boat life is real weird. If the sea conditions are favorable , good decisions are made by a focused crew, and nothing major breaks, you’re much safer with four, than with two. Got the new fuel filter system set up yet?